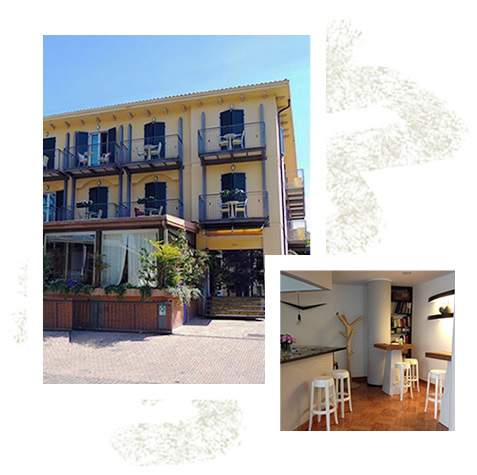 In the enchanting scenery of the Caval Point at Torri del Benaco, one of the most beautiful seaside resorts at Lake Garda, you will find Hotel Garnì "Al Caval". The Hotels position is perfect, just 200 meters away from the center and 20 meters away from the beach. It is heart fully managed since generations by the Consolini Family, which personally cares for the well-being of their customers. A warm welcome expects you with cordiality in a family environment. A rich breakfast buffet ranges from sweet to salty. Start your vacation day with an wonderful indoor and outdoor served breakfast and let us pamper you. The rich buffet for sweet and savory breakfast, the family atmosphere, the proximity of the beach and the center of Torri del Benaco, characterize your fantastic stay at Hotel Garnì al Caval. Choose the Hotel Garnì al Caval for a vacation with your four-legged friend, please do not forget to tell us you are traveling with your pet friend!